I’m dying a bunch of t-shirts that I’ll be cutting into strips to make a version of the Alterknits rug. I’m using wider strips & maybe bigger needles, and I’m thinking of carrying a strand of bulky wool along with for extra texture and strength. 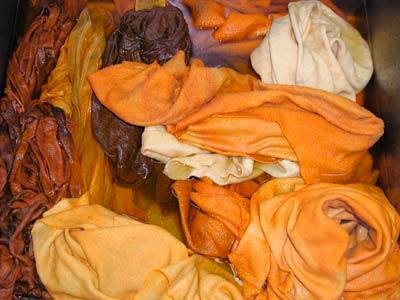 There was a giant rag bag in the hallway when we moved into the school, mostly sweatshirts & t-shirts that had been cut up to use as cleaning rags. I like terry rags for cleaning, so I’ve just been sort of waiting until I’m out of clean rags to use them, but I thought a rug might be a better use. They were a mix of grays and dirty whites, all stained, but mostly in pretty good shape. 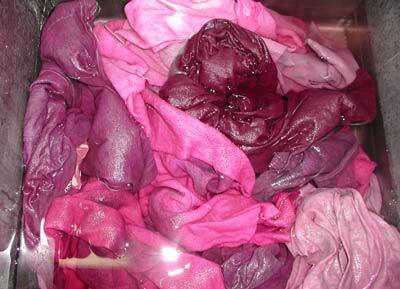 So I dyed all the whole shirts & many of the large pieces (big enough to be worth seaming into a big loop to cut up). 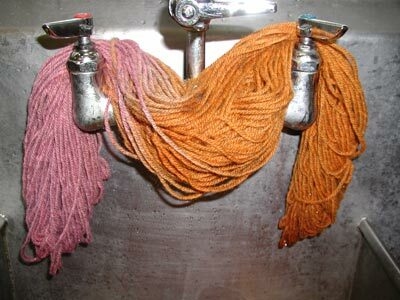 I used 2 packs each RIT dye in fuschia and sunshine orange (25 cents each from the salvage place in KC), and the intensity varied by the original color and order in the dye pot. The orange went from burnt orange to tangerine to pale peach. On the left is the hank that I cut up before I realized I didn’t want a sweatshirt-gray-with-stains rug and that I had a bunch of RIT dye from the junk store. and then I used the dregs of the dye to dip some yarn I had that was a sort of ugly “natural” yellowy gray–not amazing, but better. I may dip the whole thing again in some neon pink RIT I got at the same time. I’m going to dye all my faded grandma flannel PJs next week and pretend they’re all new. I’m kind of in love with the RIT dye right now. I’m cutting the t-shirts into inch-wide strips & the sweatshirts into 1/2″, which will hopefully even out the difference in thickness. So far, I’ve only cut up 3 shirts. It’s hard on the hands, but it’s fun winding them into the large, satisfying balls they make. The little ball was a child’s shirt. The pattern says to stop cutting the strips at the armpits & toss the top half of the shirt, but I continued cutting all the way around into the sleeves. 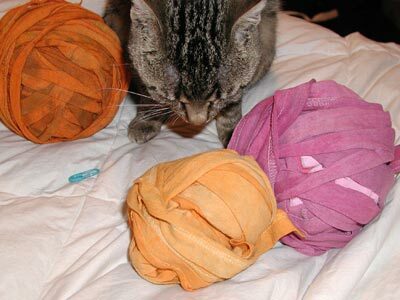 The yarn it makes is less refined, but it seems so wasteful to stop at the armpits. And I’m hoping knitting in the yarn as well will create a more textured appearance that’s forgiving of irregularities.